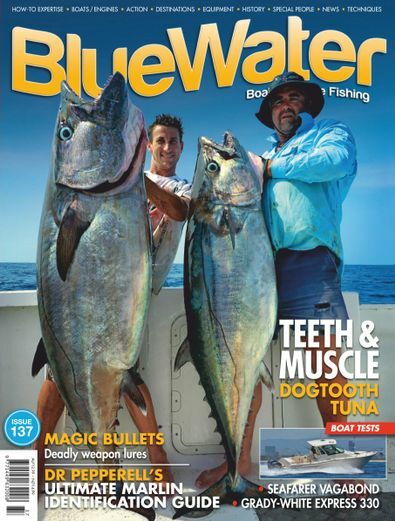 Catching a spearfish is the elusive Holy Grail for many anglers, so in this issue of BlueWater you?ll discover both how and where to easily catch yours, as well as techniques to catch Australia?s mighty yellowtail kingfish. Dr Pepperell reveals the riches of the amazingly productive Kuroshio Current, and you?ll learn how Capt Roddy Hays pioneered some of the greatest big marlin hotspots in the world while also developing his own range of lures and tackle. This issue also provides in-depth boat reviews on the Sea Fox 248 Commander and the Caribbean 2300, plus much more. Be the first person to tell us what you think about BlueWater Boats & Game Fishing (AU) and you'll save $5 on your next purchase!